Why take regular Calcium when you can now have our Pure Plant-Source GreenCALCIUM? A unique wholefood source of natural calcium, GreenCALCIUM is an organic marine plant (Lithothamnium calcareum) naturally rich in natural rich in elemental calcium, magnesium and 72 other trace minerals crucial for optimum calcium absorption and bone health. After a five-year life span spent absorbing essential minerals from the Atlantic waters, this calcium-rich plant calcifies naturally and settles on the sea bed from which it is sustainably harvested, taken ashore and washed, dried and crushed. As only the mature/aged material is harvested - not the live young plant, sustainability is assured. The Lithothamnium calcareum marine plant regenerates itself continuously, so there is no interference with its renewal process. Unlike inorganic calcium products on the market, GreenCALCIUM offers a range of minerals from a single natural source. This, together with its porous matrix structure giving the material a massive surface area, makes it highly bio-available - in other words the body easily absorbs the nutrients. The spectrum of minerals work in synergy, so the overall health benefits are enhanced. Pleasant tasting and easily mixed in drinks or added to any food, just one level teaspoon (2.8g) serving of GreenCALCIUM powder provides over 950mg of elemental calcium in a natural multi-mineral food-matrix. 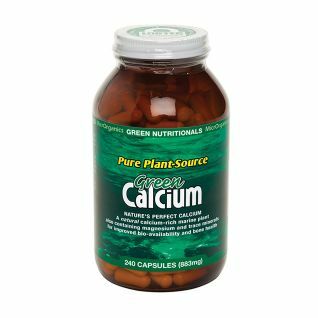 For your covenience, GreenCALCIUM is also available in convenient 100% vegetable capsules - two (2) capsules provides 600mg of elemental calcium. GreenCALCIUM is the richest natural plant-source of calcium available, is highly alkaline (pH10) and is vegetarian, vegan and paleo friendly. Calcium is essential for building and maintaining bone. Almost all the body's calcium (about 99%) is found in the bones. Our bodies cannot make calcium, so it must come from the foods we eat. When you are not getting sufficient amounts of calcium in your diet, some of the calcium crystals in bone dissolve and give their calcium back to the bloodstream. Calcium intake is important, but it's how well the calcium is absorbed into bones and teeth that's most critical. Calcium absorption may be reduced by excessive caffeine and alcohol, soft drinks containing phosphates, and diets high in animal proteins. DO WE NEED VITAMINS D and K? YES. Vitamins D and K are important nutritional co-factors in calcium metabolism and absorption – vitamin D is naturally produced in the skin from mild exposure to sunlight; this mechanism is thought to be un-reliable though as the process takes place in the sebum, and washing the skin soon after exposure may negate the process. Vitamin D is also obtained from eating foods such as tuna, salmon, sardines, egg yolks or cheese. Vitamin D is stored effectively in the body for use in calcium metabolism. Similarly, vitamin K is important and best obtained from foods such green peas, carrots, green beans, broccoli, kale and mustard greens - the best source of vitamin K is Hawaiian Pacifica Spirulina which provides 60mcg in one 3g serve. 1) It has a unique porous 'honeycomb-like' structure which reacts particularly well in the digestive system giving it enhanced absorption properties. 2) Its molecule has a very large surface area which allows faster solubilisation and rapid ionisation of the calcium, resulting in better absorption. 3) It contains other important minerals necessary for the absorption of calcium including magnesium, boron, selenium, zinc, strontium and iodine. All these pure, plant minerals are in the balance Nature originally intended for enhanced assimilation. After a five-year life span spent absorbing essential minerals from the Atlantic waters, this calcium-rich marine plant calcifies naturally and settles on the sea bed from which it is sustainably harvested, taken ashore and washed, dried and crushed. As only the mature/aged material is harvested - not the live young plant, sustainability is assured. The Lithothamnium calcareum marine plant regenerates itself continuously, so there is no interference with its renewal process. GreenCALCIUM is harvested in Ireland and Iceland under strict ISO 9001-2000 certification, is Organic, Kosher and Halal certified and GRAS Approved. Calcium requirement and the actual take up of Calcium by the body is influenced by many factors. Government agencies are reviewing RDI (recommended daily intake) for Calcium and suggested intake levels are being raised. Children have a higher need to build bones and teeth, just as we need to keep making deposits into our 'Calcium Bank' as we get older. Conditions that reduce calcium absorption include high or excessive intakes of oxalates and phytates, found in foods such as spinach and oats. Consumption of alcohol, coffee, sugar, or medications such as diuretics, tetracycline, aluminium containing antacids, hormonal imbalances and stress reduces absorption of calcium and other minerals. Lack of exercise reduces calcium absorption as well as causes an increase in calcium loss. A lifestyle of immobility also leads to calcium deficiency. Calcium deficiency increases risk of bone disorders such as osteoporosis, and may increase the chances of obesity. Factors that improve calcium absorption include adequate amounts of protein, magnesium, phosphorous, trace minerals and Vitamin D. Vitamin D is best obtained from regular exposure of the skin to moderate sun-light. The table to the right is a guide to recommended intake, but bear in mind the factors mentioned above. Less than half of all Australian adults get their daily recommended intake of calcium. WHAT IS THE IDEAL CALCIUM-MAGNESIUM RATIO? Laboratory formulated calcium supplements commonly have a 2:1 Calcium-Magnesium ratio, but calcium-rich whole-foods and plants do vary and cow’s milk, human breast milk and GreenCALCIUM have a natural, lower Calcium-Magnesium ratio – there are no calcium-rich whole-foods or plants that have a Calcium-Magnesium ratio of 2:1. Independent clinical trials have demonstrated the clear benefits offered by Aquamin (TM), the ingredient in GreenCALCIUM. Ongoing research is helping to increase the body of evidence supporting Aquamin's bone & joint health benefits. Click on the papers below to learn more about the proven advantages offered by Aquamin. A double-blind placebo-controlled parallel group study in post-menopaual women to assess the effect of calcium supplementation on markers of bone resorption. Science and popular wisdom tells us that the key to happy, healthy longevity is to Keep Moving. As we get older our joints stiffen leading to decreased mobility and possible dis-comfort during basic activities such as walking or mild excercise. The resulting inactivity can lead to more serious conditions such as diabetes, osteoporosis, joint inflammation and arthritis. Just as importantly, difficulty in mobility results in less participation in fun activities such as travel and family pursuits. Extending our ability to participate in an active lifestyle relies on the health of our bones and joints, and key to this is maintaining adequate levels of minerals and particularly calcium in our bodies. Calcium levels have been problematic for human kind ever since we adopted the Western Lifestyle. We no longer consume large quantities of green leafy vegetables (natures best Calcium source), and we do less of the weight bearing activities that help maintain bone density and we eat foods which actively strip Calcium from our bodies.